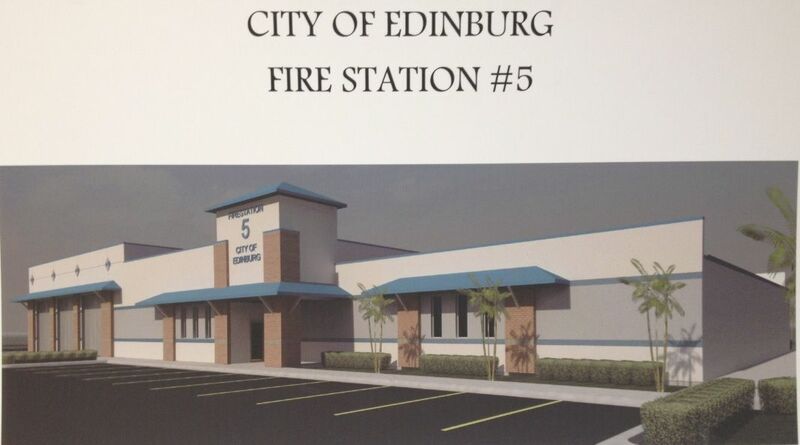 EDINBURG — Firefighters here will soon be able to respond quicker to emergencies in North Edinburg. City officials broke ground Wednesday on a new fire station. The 13,000-square-foot facility — located at 8502 N. Jasman Road near the Edinburg Solid Waste Department and the Landfill— is the city’s fifth fire station. The building will house 10 firefighters and an ambulance that will serve over 60,000 residents living near the area, Edinburg Mayor Richard H. Garcia said. Edinburg will pay about $1.4 million for the project and will split the rest of the cost with two other entities. Hidalgo County Precinct 4 will contribute $1 million and Emergency Service District No. 3 will give $500,000. The station has been in the works for over two years and has seen some delays as the local governmental entities work to straighten out the kinks, Garcia said. City officials initially expected to see the building open its doors in February 2016. And while delays in construction usually equate to higher costs, officials don’t believe it will affect the price of the project. Construction should wrap up early next year. Once open, the new station will cut response time for the area by 10 to 12 minutes, Garcia said. The investment in the building is two-fold. “Our first responders are important to our city, and we’re happy to do this for them because it’s not just for them — it’s for us,” Garcia said. In Edinburg, volunteers respond to more than 2,000 incidents per year and cover about 200,000 square miles within and out of the city.